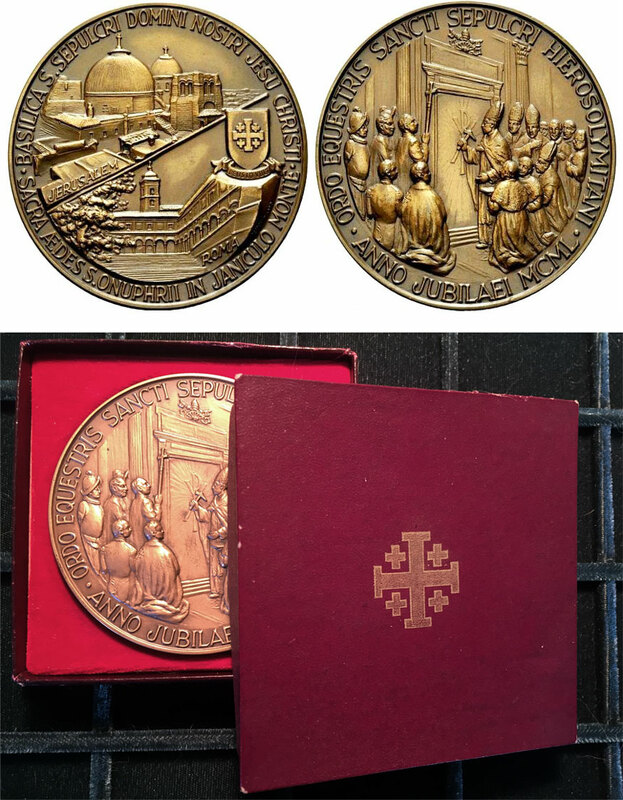 Pius XII (1939-58) large bronze medal, 79mm in diameter, commissioned by the Equestrian Order of the Holy Sepulchre of Jerusalem. Obverse: The opening of the Holy Door; around, ORDO EQUEESTRIS SANCTI SEPULCRI HIEROSOLYMITANI . ANNO JUBILAEI MCML. Reverse: the basilica of St. Sepulchre in Jerusalem at top; the church of St. Onofrio on the Janiculum below; the arms of the Equestrian Order of the Holy Sepulchre of Jerusalem to the right. Around, BASILICA S. SEPULCRI DOMINI NOSTRI JESU CHRISTI . SACRA AEDES S. ONPHRII IN JANICULO MONTE.